Kuala Lumpur (27 January, 2019): Universiti Kuala Lumpur (UniKL) turned on the power to defeat TNB Thunderbolts 4-1 in the TNB-Malaysian Hockey Premier Division match at the National Hockey Stadium in Bukit Jalil today. 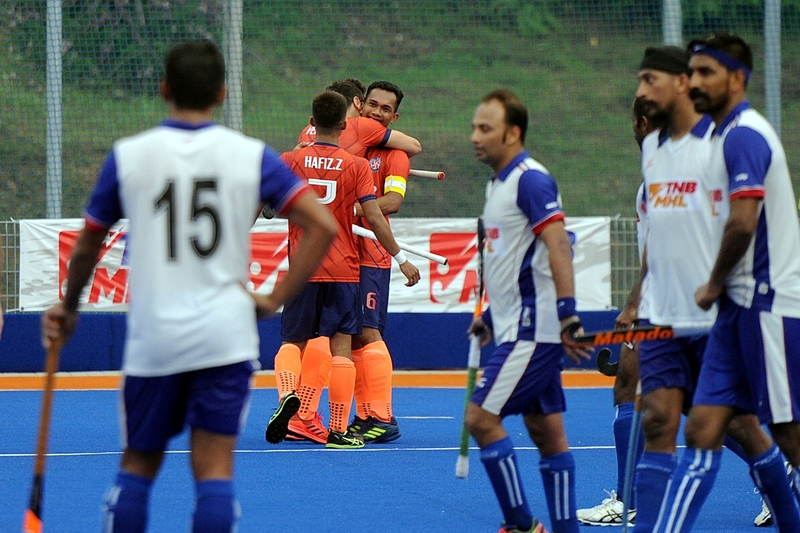 Australian Kieran Govers steered the 2018 overall champions ahead with a fifth minute field goal, Razie Abdul Rahim converted penalty corners (25th and 39th minutes) to extend UniKL’s lead to 3-0 at the end of the third quarter and Netherland’s Robbert Kemperman added the fourth in the 51st minute as UniKL capped a 4-1 victory. Muhammad Aminudin Mohd Zain reduced the deficit for Thunderbolts in the 46th minute via a penalty corner. This is the second time UniKL had defeated Thunderbolts this season. They registered a 4-1 win in the quarterfinals stage of the Tan Sri P. Alagendra Cup on January 4. “It was a much improved performance from the team today and we had also converted two penalty corners. I was never worried on penalty corner conversions as you can count on Razie just as he does for the national team when it mattered most,” said UniKL coach Arul Selvaraj. “The three points today is what we needed most and the win was exceptionally good. UniKL players are showing better understanding after each game and I’m very happy with this development,” he added. In another match, Tenaga Nasional Berhad (TNB) edged Terengganu Hockey Team (THT) 3-2 at the Batu Buruk Hockey Stadium in Kuala Terengganu and Maybank edged Universiti Teknologi MARA (UiTM) 3-0 at the National Hockey Stadium in Bukit Jalil. Whilst THT held a grip at the top of the pool with 15 points, UniKL take second spot on 13 points, pushing THT down to third position (10 points). Maybank are in fourth spot (9 points), UiTM and Nur Insafi in fifth and sixth positions respectively and Thunderbolts at the bottom of the seven-team league with no points to show following five consecutive defeats. UniKL and Thunderbolts got off on a cautious pace although it was Thunderbolts that dared venture further by earning a penalty corner in the second minute. However, Mohd Syamim Naim’s direct push was cleared away by a defender. Clearly needing a win against Thunderbolts today to keep pace with TNB and THT at the top of the pool, UniKL dominated the second and third quarters. However, a lapse in defence saw the fitter Thunderbolts break away in the 46th minute to earn their second penalty corner and Aminudin sneaked the ball past Ireland goalkeeper David Harte. UniKL’s next match is against Maybank on February 1 at the Tengku Abdullah Stadium in Bangi.